Microblogging startup Tumblr, based out of New York, has raised $5 million more from the same investors who’d already bankrolled the company with a little over $5 million over two previous rounds, namely Union Square Ventures and Spark Capital. The financing round, Tumblr’s third, was first reported by MediaMemo and comes at a time when the three-year-old startup is starting to push a bunch of buttons to try and generate revenue from the lightweight blog publishing and management service. 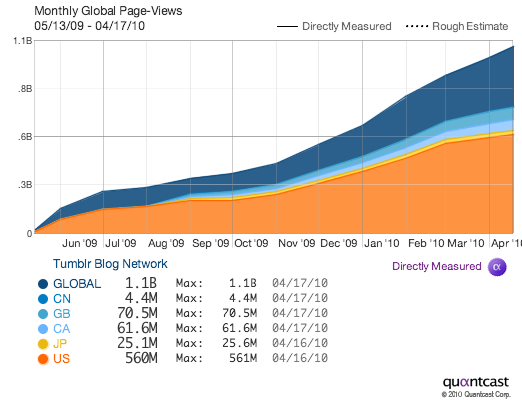 Tumblr recently surpassed the 4 million registered users milestone, and founder David Karp (23) tells MediaMemo that the service is now generating 1 billion page views a month, up from 2 million Tumblr bloggers and 420 million monthly impressions half a year ago. The growth in users and usage is clearly there, and the startup is now looking at ways to generate some coin with the service. Whether it will succeed in doing that in a sufficient way to justify the +$10 million in venture capital it has raised to date, remains the question.